When you are waiting for a train, don’t keep perpetually looking to see if it is coming…. It will not come any sooner for all your nervous glances and your impatient pacing, and you will save strength if you will keep quiet. 5) And yes, make sure the ruffle edge is really the edge I want. 6) Estimate amount of yarn needed. The problem is that we attempt to solve the simplest questions cleverly, thereby rendering them unusually complex. One should seek the simple solution. Yes, I have finally found solutions to my most pressing knitting dilemmas. First up the baby sweater. The problem was finding an edging that would work both at the sleeves and bottom edge of the sweater. I wanted an edging that was clearly feminine, would not require knitting gymnastics, or be overly frilly. The ruffle edge minus the eyelets and worked on a smaller scale goes nicely with the yarn and my gauge. The adjustments I made make it dainty enough to look good as a sleeve edging too. I have 2 patterns in mind for the transition from edge to sweater body stitch. I will have to see which works best. Both are very simple to knit yet visually interesting. 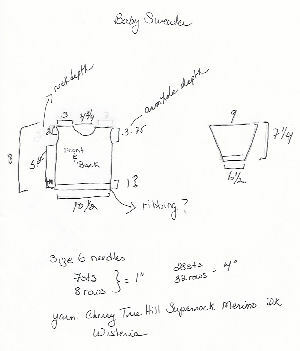 Before I cast on, though, I need to rework some of the numbers in the schematic. Sleeve cap and armscye need to be recalculated. I want to go with a fit-in sleeve so I need to redo the armhole depth, etc. Do I feel a migraine coming on? You betcha! I am not fond of math and math is not fond of me. Put that truth together with this is my first time ever designing an armhole and sleeve cap and it’s an equation for trouble. But let me not project. The second knitting dilemma concerned the mitered square baby blanket. It pretty much solved itself. I was debating on how to fit the squares together to create a nice color pattern. I put the blanket squares aside to take the dogs for a walk. When I went to pick them up again I noticed the color pattern they were making. A little tweaking here and there and the issue was resolved. It is a simple but nice pattern. These two dilemmas really kind of worked themselves out. But first I had to release my strangle hold on the problems. I had to let go. A friend told me a long time ago that the way you work a knot out of your yarn is not by pulling it tight but by relaxing and loosening it. She said figuring out problems worked the same way. Relax and let go. The answer will appear. I find that decisions, mostly creative types, are best left to simmer and resolve themselves. That is what I am going to do regarding the baby sweater hem. One minute I’m thinking small ruffle, the next something else. I can’t seem to make a decision so I am going to turn my attention to my other wpis: one second sock and a mitered square baby blanket design. The second sock has vexed me now for weeks. The first sock was knit without a problem, its a simple pattern, but this second one is proving to be the devil itself. I think its in it fourth or fifth time-out for being a bad sock. The mitered square baby blanket design is almost at the point where I have to make a design decision. Maybe I stick with the nasty little sock. The composition of the knitted baby sweater rolls forward slow and steady. I spent most of last night swatching various edgings not liking any of them. The one thought I kept comming back to after each swatch was that this yarn is beautiful enough to stand on its own without a lot of fancy stitch work. In fact, fancy stitch work seems to mar its beauty. I have found some edgings of interest. I like the way the yarn itself doesn’t get lost in the ruffle design. I think I may swatch this one tonight. This one is an interesting way of introducing a second complementary color into the sweater design. A band just above the hem, repeated on the sleeves. Whatever I do on the hem of the sweater will be repeated on the cuff of the sleeves so it has to look appropriate in both places. The two hems above will each impart a distinct “feel” to the sweater. And so the decision on the hem impacts the whole way the sweater will go. The ruffle is more feminine in “feel”; the complementary color block hem “feels” more modern, geometric, bolder. The type of hem design I choose will affect the rest of the sweater design. I did manage to nail down the sizes for a baby 6 to 12 months old. I worked up a rough schematic of sorts. In the schematic are the size of things. My yarn, the needles and the gauge in stockinette stitch are all noted. The question mark refers to the hem area and how wide it will be. Once I settle on the hem design I can firm up the body number. The majority of the sweater will be knit in stockinette stitch…..I think. Depending on the hem I use I may or may not insert a small lace panel near the neckline. The mantra I keep repeating to myself is “Simple. Elegant.” That’s the feeling I’d like the sweater to achieve. Frankly, the ruffle edge does not seem to fit that mantra. When I think “Simple Elegant” I envision clean lines, understated design elements that all come together in a timeless fashion. Onion soup sustains. The process of making it is somewhat like the process of learning to love. It requires commitment, extraordinary effort, time and will make you cry. Who knew that knitting was like making onion soup? Commitment, extraordinary effort, time, crying. Yep those are all elements of my adventure in knitting. I must be honest here, I have serious reservations about documenting my day to day progress or non-progress. You see, if I completely knew what I was doing, I’d have no problem sharing the success and wisdom with you. However, this is the first time at trying my hand at designing a baby sweater. If failure, obstacles, or serious crying make you squeamish, you might want to turn your head and not read further. If, however, you find pleasure in another’s suffering, by all means continue reading. This knitting adventure is for you. First, I fell in love with what I hope will be the perfect yarn for the project. Cherry Tree Hill Supersock DK weight 100% merino yarn in Wisteria. The color is gorgeous and the yarn is wonderfully soft. Because of the gentle gradations of color through out the yarn I have decided to let the beauty of the yarn take center stage as opposed to stitch work like cables. I am thinking the sweater will be for a girl size 6-12 months. A pullover, though I’d really like to make it a cardigan. If it is a pullover, I would like to have some sort of decorative hem around the bottom of the sweater and bottom 2 inches or so of sleeves. I am thinking of small, open work (almost lace-like) decoration for the hems. At the moment I am casting around; looking through my knitting stitches books, surfing the net, thumbing through magazines to see if any particular open work or part of any open work hits me as right. At the same time, I am also thinking of necklines and debating whether I want to include a bit of complementary color in apricot of the same yarn. What I am most worried about right now are the measurements: sleeve width & length, armhole depth, chest circumference, neck opening, waist, etc. There are many resources on the web where I can find the answers and I need to do that and nail down the exact numbers. Once I have the exact numbers, then I can swatch for a gauge. Once I have the measurements and gauge I can get a better idea of what stitches will fit …. I hope. It’s onion soup: commitment, effort, time, and crying. I am not a bottom-less pit of knowledge when it comes to computers, but I get by. While trying to upload my free knitting pattern to my blog (see the side bar My Free Patterns) I realized that whenever I try to expand my horizons there are lessons (learning) that must take place first. Usually I do not forsee these “lessons”. I get an idea and then I want to get on with it only to realize that I am missing pieces of knowledge that are necessary completion. I’m not quite as bad as jumping into the deep end of the ocean only to surface and say, “Excuse me, how does that swimming thing go again?” But I am bad. What usually happens is the idea takes longer (forever it seems, sometimes) to come into being while I search here and there, then back to here again for the knowledge I need to get the thing completed. And today it seemed to take me forever to simply find the knowledge (information) I needed to upload the pattern pdf and create a link to it. Yes, “life is a succession of lessons”, the learning of which goes right out of my head, sometimes. I know the next time I want to upload I’ll have to go through all the knowledge gathering again. 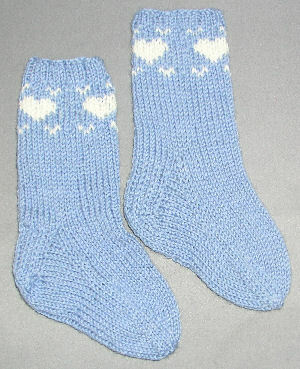 The free pattern is called Hearts Abound Baby Socks. They are sized 6 to 12 months old. I have a hat pattern that goes with them, Hearts Abound Baby Hat, and that is in my Etsy store. The link to my store is also on the side bar. I hope you enjoy the socks pattern. I come to knitting through my mother and crochet through my grandmother. At the age of 8 or 9 I can remember being shown by my grandmother how to crochet. My grandmother was a wonderful woman who crocheted regularly and designed her own patterns. She worked full-time outside the house, not all that common for a woman back in the late 1950s and early 1960s. Her elegant crocheted evening bags were in heavy demand by women, who to me, seemed very worldly and very beautiful. While I don’t have clear recall of the crochet lessons my grandmother gave me, I still have the end product: a beautiful afghan. It is still in excellent condition. It still gives me comfort. Her love for me, woven into each stitch, radiates its warmth when the world around me seems cold. And while I don’t clearly remember the crochet lessons, some of what she taught me of the art remained. For when I began to explore crochet in earnest in my 40s the language and techniques were familiar and stirred a part of me that had been untouched for so long. Though I consider myself primarily an knitter, I have an appreciation and love of crochet. I was also 8 or 9 when my mother tried to teach me to knit. Unlike her mother, my grandmother, she did not crochet. What I remember most was that my mother was not a patient teacher. Knitting was a struggle for me. My knitting stitches were so tight around the needle that I had to wrestle my other needle into each stitch rather than gently insert it. Knitting hurt my hands. But those unsuccessful attempts at knitting did not stop me from picking it up again when I was in my 40s. And while I needed to relearn the language and techniques, knitting quickly came to be the dominate fiber art for me. I basically learned knitting by following pattern after pattern. In following the patterns I studied what each stitch did, how it worked with others. Thought about what the designer of the pattern was doing, how she achieved her goals. When I began to alter patterns to suit my tastes it was not long before I was designing my own patterns. Nothing is lost. I have been through a number of large, life-altering events in my 52 years which have understandably left their marks. But who would have thought that at 8 years old, the simple afternoons I spent learning to crochet and knit would resonate so over time?